Karen Oberhauser, a renowned scientist and researcher, has published two studies on the impacts of mosquito spraying on monarchs. Most mosquito control district use a variety of different pyrethroids in mosquito abatement efforts, and these can be sprayed as ULV (ultra low volume, or aerosol) treatments, or as barrier treatments. The ULV treatments affect insects as they’re flying, and the barrier treatments remain on leaves, providing a barrier to mosquitoes that harbor in wooded or shrubby areas during the day and come out at dawn or dusk. 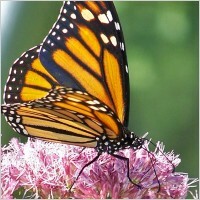 While it is generally thought that the formulations of permethrin used for mosquito control do not pose unreasonable risks to wildlife or the environment (U.S. EPA 2003), our study is one of the few that has examined the nontarget effects of barrier applications of permethrin on foliage-inhabiting arthropods, like monarchs. Both studies sowed impacts on monarch larvae AND adults, with leaves from the barrier treatments resulting in higher mortality than control groups up to 3 weeks after application. The PDFs can be accessed from her website (click on the publications link).